It is mixed navy blue, blue and white meshed. The Schwinn XS are silk screened over the chest. Light padded elbows. 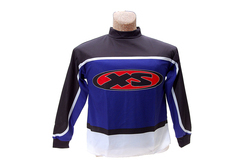 This lightweight and breathable jersey will be excellent on race day! Sized Kids 4X-Small will fit chest size 30-32. Arm length - 15" arm pit to cuff. See our store for other sizes.